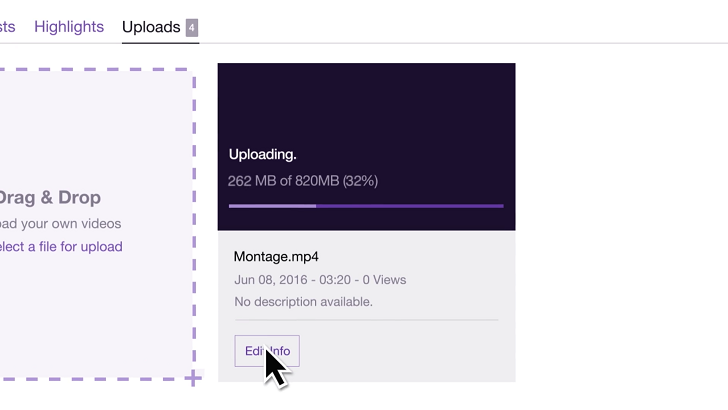 Starting today, Twitch streamers can upload videos through the site's video manager. The uploads are saved indefinitely, unlike past broadcasts. You can also see stats for your content, similar to YouTube's analytics. Twitch also allows users to download past broadcasts and highlights directly, to facilitate easier video production. This feature is an open beta, and the company is working to implement "a laundry list of features" with user input. For example, the allowed video format for uploading is limited to H.264 MP4 video with AAC audio - far less file compatibility than YouTube. Uploaded video is also limited to 1080p 60FPS, with a total file size not exceeding 10GB. Limitations aside, it's nice to see competition to YouTube for once. It seems like every month YouTube implements awful policies or en masse removes videos, causing a flame war in their own community. Video upload support might be the first move in Twitch's (and Amazon's) plan to battle YouTube's dominance over internet video.